Servings: This was a side dish – you’re supposed to use a 9×9 dish but I used an 8×8. It would easily serve 8 people as a side dish. Modifications: I used slightly more of everything except the smoked cheddar. A bit more of all the cheeses, pasta, milk, cream etc. The spices I added were garlic powder, salt and pepper, red pepper flakes and paprika. 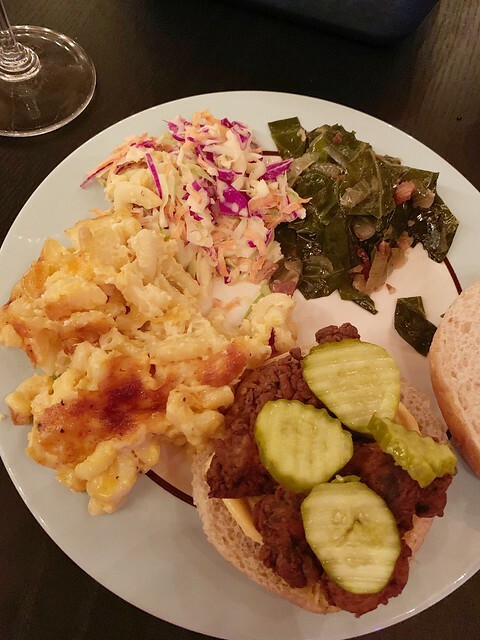 Notes: We have made several mac and cheese recipes – for this meal, I wanted one that most closely resembled the mac and cheese at Revival to go with fried chicken sandwiches, collard greens and coleslaw. This fit the bill, and was quite delicious – I think I should have used a bit less pasta, and taken it out of the oven after 35 minutes. I wanted it to be a bit creamier than it was. 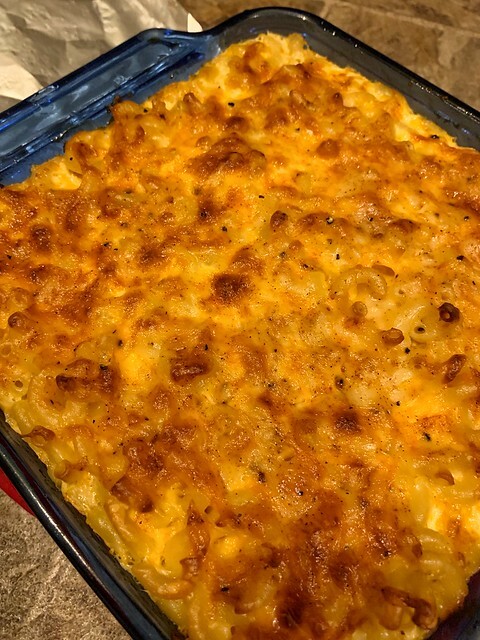 The ideal for me is a crust on top, no breadcrumbs (there is a time and a place for breadcrumb mac and cheese but this wasn’t it) but once you get through that crust I wanted it to be super creamy. I’ll keep trying til I get it!!! I also forgot to add the eggs to the milk mixture and then just kind of shoved them in the pasta mixture – I think the eggs bind the whole thing a bit more so I may have preferred this version without them. Don’t get me wrong, this was still extremely good – the crust on top was perfect, flavor was right on and not bland at all, but more of a casserole that could be cut into pieces. This entry was posted in cheese, milk, pasta. Bookmark the permalink.